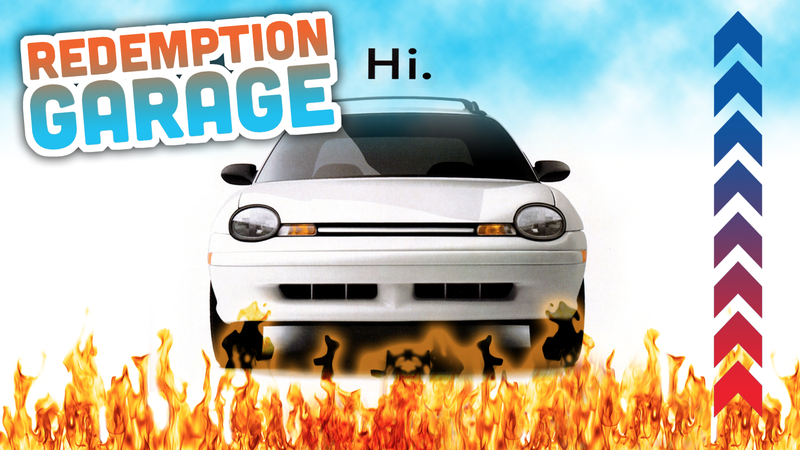 Yes, friends, Redemption Garage is back, ready to do our damnedest to force you to, likely painfully, re-think some conceptions about cars you’ve long ago relegated to your mental scrapheap. This week, I want to do yet another Dodge/Chrysler product, the Dodge Neon. Specifically, the very first generation of Neons, the ones built between 1995 and 1999. While I do know that there is a decent-sized cult of Neon supporters out there, I think the Neon deserves a shot at redemption because the general consensus of the car seems to be that it was a cheap, plasticky little shitbox. One of our very own writers seems to hold that opinion, too, but he’s pretty used to being wrong, so this will be good for him. I think that, if you’re willing to give the car a second chance, you’ll find that the Neon was one of the last all-new cars to be unashamedly cheap, friendly, and fun. An unpretentious and very usable little car, with far more style and character than you’d expect. As a bonus, it was quicker and more fun to drive than any little econobox should be. The Neon started life as a fairly bonkers 1991 concept car with a two-stroke engine, four sliding doors, and a freaking onboard trash compactor. It was a bold take on the standard small, entry-level sedan formula, and while the production version stripped away all the really weird two-strokey, trash-compacty stuff, the end result still captured the fun essence of the concept. It’s easy to forget today, but that first generation Neon gave entry-level car buyers something they weren’t used to finding in a cheap economy car: power. Sure, this is relative power, both for the era and the segment, but it’s worth noting that the base-level Neon’s two-liter four put out 132 horsepower, with an option for a 150 horsepower engine in the hotter R/T version. This is in an era when a Nissan Sentra had 115 HP, a Saturn made about 100, Honda Civics made between 102 and 127 HP, a Volkswagen Golf made 115, you get the idea. Remember, this was a car that started at $9,995 (about $16,500 in today’s dollars), just a bit more than what a four-door Nissan Versa goes for today, and the Neon had 22 more horsepower and wasn’t nearly as likely to make you want to open your wrists out whenever you walked up to it. For a big company to give their cheap, entry-level car this kind of attention is just not something we really see today, which hurts me a bit, inside. There’s also the styling of the Neon, which I feel is not just good, but actually important. I think it’s important because the Neon is one of the last mass-market cars that is not based on a retro design (Mini, New Beetle, Fiat 500, etc.) to have a purposefully and objectively friendly face. That friendly face formed the basis for the Neon’s clever first ad campaign, the “Hi.” ads you may remember. This was one of the last cars introduced new that was courageous enough not to try and look idiotically and needlessly agressive. This was a car designed to look like it wanted to be your pal, to be that trusty and plucky partner you knew you could talk into almost anything. The often-optioned roof rack just added to the appeal, too, like a fun hat. Why wouldn’t you want a car with that sort of demeanor, instead of one that looks like it might shiv you, or just looks cranky all the time. Really, is this a better design? No, of course it isn’t. The Neon had a clean, modern look that I think would still be viable today. The round lights, the subtle single-blade grille, the good contrast of unpainted gray bumpers on the lower-spec cars, the bold variety of colors (at least initially) with stripe kits on some specs, the pleasing proportions, all of these add up to an appealing-looking car that didn’t feel like everything else on the road. Tom Gale was the designer behind the Neon, and was also behind the Dodge Viper, Plymouth Prowler, and the big rig-inspired 1994 Dodge Ram. When I hear people disparaging these early Neons today, I have to wonder if they’re really considering the car. Sure, it was cheap, and as a result had plenty of corners cut—you could get power windows up front, but not in the rear, if you were foolish enough to not get the five-speed manual, the automatic was only a three-speed, it was unashamedly plastic, in many places, and so on. But it was also quick and handled way better than anyone expected, it had a distinctive and appealing look, got quite good gas mileage, was roomy and practical for its size—these are all things all small, cheap cars should be. The Neon did cheap the right way, with dignity and a sense of humor. It was one of the last entry-level cars that wasn’t obsessed with trying to pretend it was something more than it really was. It embraced its status and had fun with it. They should have had a wagon version, though. That would have really made it amazing. I have a lot I want to say about the Dodge/Plymouth Neon, as it’s got a fascinating history behind it. But for now, I’ll just say that I agree with Jason entirely. The Neon was a great machine, even if it did have a three-speed automatic slushbox until 2001, and even if it couldn’t hide some of its clear cost-cutting measures on the inside. The Neon has really garnered an enthusiast’s following since it left production in 2005, and I hope it continues to do so. seriously, why no Neon wagon?